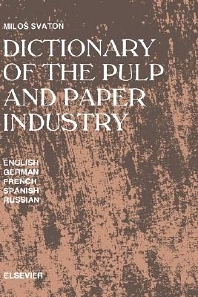 Contained in this dictionary is a selection of the most frequently used terms in pulp and papermaking. It is intended to provide scientists, R & D workers, students, technologists and international trade experts with a vocabulary of terms relating to pulping and papermaking technologies, cellulose and paper chemistry, properties of pulp and paper mills. It also includes terms related to pulpwood and other raw materials for pulping and to operations for converting paper and board.